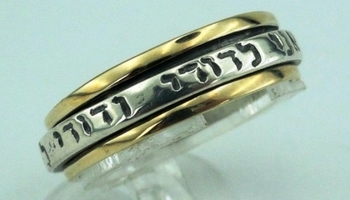 Silver and gold ring with an hebrew verse spinning bands Terminal static gold 9 carat bands . The ring base is blackened to make the spinning bands more visible. It is a beautiful and unique ring that can be used as a wedding band, or as a love message . Ani le dodi love ring. EXCLUSIVE! "I am my beloved's, and my beloved is mine" (Song of Solomon 6:3). Engraved in HeBrew or Latin (Ego dilecto meo et dilectus meus) around a simple Band of 9K gold or sterling silver, these ancient words proclaim your devotion to your beloved. Whole sizes 5‑12.